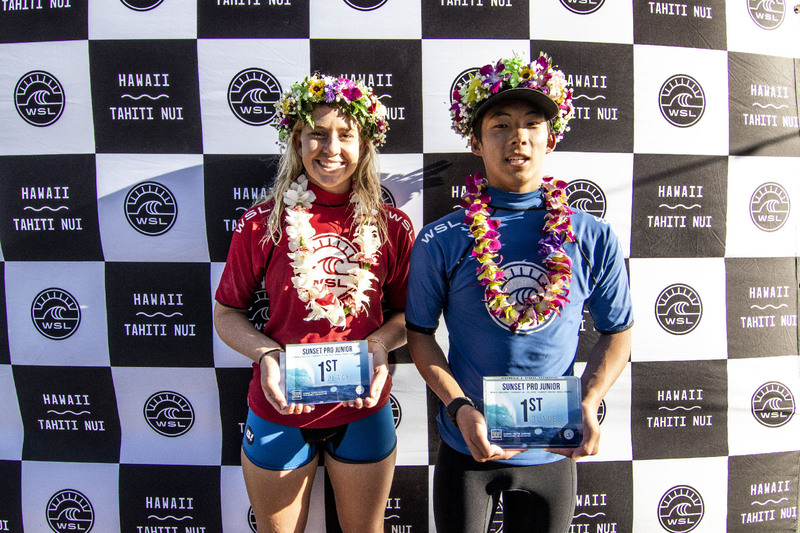 HALEIWA, Hawaii (January 19, 2019) – Professional surfing in Hawaii has awarded its first event titles of the year as Roi Kanazawa (JPN) and Gabriela Bryan (HAW) earned victories today at the Women’s and Men’s Sunset Pro Junior, the opening competitions of the World Surf League (WSL) Hawaii/Tahiti Nui 2019 regional calendar. One of Oahu’s most iconic competitive venues, Sunset Beach, delivered breezy, challenging conditions throughout the day with consistent four- to six- foot wave faces and strong yet favorable easterly tradewinds. Caption: Back-to-back event champion Gabriela Bryan pushed the pace all day. Women’s event champion Gabriela Bryan successfully defended her title, quickly establishing herself as the in-form surfer of the competition and posting the highest scores on the women’s side of the draw. Displaying the confidence and talent that launched the 16-year-old to finish atop both the Hawaii/ Tahiti Nui Women’s Tours – Junior and QS – in 2018, Bryan easily won all of the three heats she surfed today, including the most important thirty-minute Final. Caption: Roi Kanazawa about to stick the landing on his way to a maiden Hawaii event victory. It was a much more dramatic finish to the Sunset Pro Men’s Pro Junior. Needing a 6.10 to take the lead with under a minute left in the Final, Kanazawa hit a series of committed, on-rail turns to earn a nail-biting 6.73 on his very last wave. It was enough to steal the win from Crosby Colapinto (USA), who had led for the majority of the thirty-minute heat and who had already comboed 14-year-old Levi Young (HAW) and 16-year-old Eli Hanneman (HAW), third- and fourth-place finishers, respectively. With defending champion Finn McGill (18, HAW) no longer age-eligible to compete at the Junior level, the Men’s Sunset Pro Junior was destined for a new champion this year. The win was Kanazawa’s first in Hawaii, and second Pro Junior win after a 2018 victory at the Minami Boso Junior Pro in Chiba, Japan. Kanazawa successfully controlled his nerves throughout the competition, having put the men’s field on notice with an 8.83 in the Quarterfinals that would prove to be the event’s highest score. With poise and confidence beyond his years, Kanazawa consistently attacked the challenging, oft-shifting Sunset Beach lineup, and dropped perhaps the maneuver of the day with a huge lip-smack-to-free-fall 7.73 in the final. The shifty, open-ocean playing field of Sunset Beach – the only Oahu venue where caddies are permitted in the lineup – pushed athletes to stay active in chasing down waves and making the most of available scoring opportunities. The up-and-coming talent was undeniable over the course of the day, with over 80% of the men’s field and nearly three-quarters of the women’s field representing Hawaii. Experienced performers were tested by younger newcomers eager to build confidence and further develop as competitors. Ariana Shewry (NZL), the only non-Hawaii surfer in the women’s final, surfed with equal determination and grit throughout the day. With no waves ridden and just seven minutes on the clock, the 15-year-old quickly found her only two scores of the heat, fighting her way into a well-deserved second place. Rounding out the women’s final were Leila Riccobuano (HAW), 15, and Summer Ivy (HAW), 17, who along with Shewry chaired Bryan up the beach. Colapinto, 17, looked well on his way to winning the Final until Kanazawa’s last-minute heroics, but it wasn’t to be. However, the San Clemente, California, native continues his Pro Junior success from 2018 where he finished No. 2 on the North America ratings and now turns to the bigger stage on hand in Sunset. Colapinto is the younger brother of WSL Championship Tour competitor Griffin Colapinto (USA), who has also found success at Sunset Beach and in Hawaii, having won the Vans Triple Crown of Surfing in 2017. All eyes now turn to the Sunset Open Men’s QS 1,000 division, to be contested on the three best remaining days of conditions of the event window. Contest organizers are eagerly anticipating a new run of solid swell at Sunset Beach for next week, Tuesday, January 22 – 24. Back on the regional Juniors calendar, next up are the Men’s and Women’s Papara Pro Junior Tahiti (Papara, March 10 – 15). Results at these competitions will be crucial in ultimately determining the region’s five qualifiers – three Junior men and two Junior women – for the prestigious year-end World Junior Championships (tentative, December 2019, location to be announced). The Sunset Open/Pro Junior is presented by the Hawaii Youth Surfing Development Organization (HYSDO), a 501c3 nonprofit providing greater opportunities for local youth in and around surfing. Full results and heats scores are available worldsurfleague.com and on the free WSL app. Community partners (including WSL) are currently undertaking long-term erosion mitigation efforts at Sunset Beach. The public is encouraged to be mindful of limited parking, carpool or choose public transportation where possible, and use designated beach access points when on-site to protect the new sand dunes. 1st & 2nd advance. 3rd=5th place. 4th=7th place. 1st & 2nd advance. 3rd=9th place. 4th=13th place. 1st & 2nd advance. 3rd=17th place. 4th=25th place.